You are keeping your mattress clean by using a protective cover, but how often do you need to wash a mattress cover? This guide will help you learn how to wash a mattress cover and show you how often you need to clean it for the best results. ​Can You Wash a Mattress Cover? ​​​Yes, you absolutely can wash a mattress cover. It is recommended you regularly launder it due to the buildup of skin cells, liquids and other allergens. Before you toss it into the wash there are a few things you should know before you wash a mattress cover. ​Consider the temperature you wash your bed cover at... do not wash it on high heat. ​Just like washing a mattress protector​, you can clean a cover in the washing machine. However, you should only do it on lukewarm or cold temperatures. Most people are aware that hot water can kill bacteria. But, you do not want to use any hot water on your mattress cover and pad. The materials that compile your mattress cover can be damaged or weaken the waterproofing when you use water that is too hot. Even the best made mattress covers will break down from really hot water. This is the same for when washing new sheets. ​​​You also should only use a mild detergent or a natural cleaner you can make at home when cleaning your mattress cover. It may be considered really dirty when you think about everything the mattress houses over the time between washes. Using a harsh chemical cleaner such as bleach will end up ruining your mattress ​cover instead of cleaning it. If you would like to add a little more oomph to your machine wash, add in a half a cup of white vinegar. Vinegar is a naturally acidic choice and gentle in the wash. The high acidity levels in vinegar are able to kill and remove various odors, bacteria, and even some stains. It's even good for cleaning carpet and flooring. ​​​Finally, create a schedule for washing your mattress cover. Since you use sheets on top of it, you don’t need to wash the mattress cover as regularly as you do your sheets. 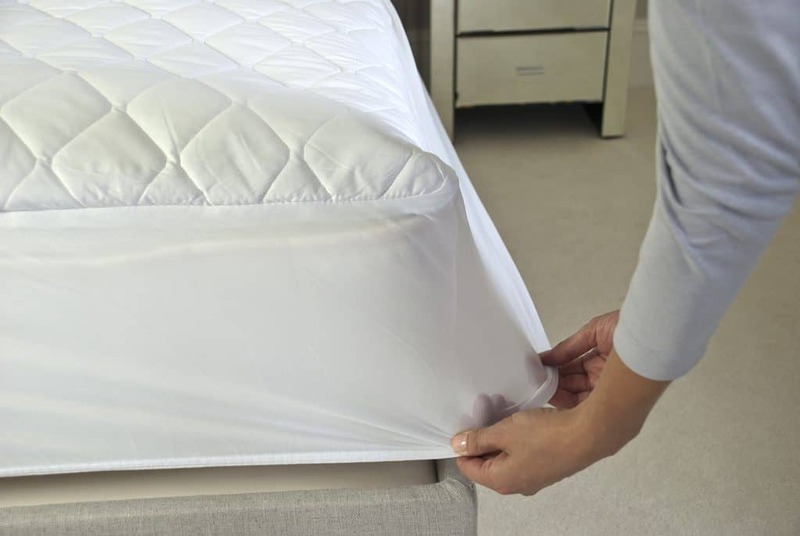 Now that you know the basics of washing a mattress cover you can clean your mattress pad without worry. If you ever have a question about laundering your mattress ​cover, let it tell you what it needs by reading the fabric care tag. Not all mattress ​covers are made with the same material. While most of them can be easily washed, there are a few that might not make the washing machine cut. That doesn’t mean you can’t still wash them. It just means you will have to wash them another way. ​​Cotton, vinyl, and down mattress covers are almost always able to be cleaned in the washing machine. Always make sure to read the fabric care label to make sure your ​bed pad is okay to machine wash. Follow all the required settings, such as cold water only and low heat to dry. ​​More complex mattress covers are those made from foam (the egg-crate variety). You don't want to wash foam based mattress covers in a washing machine. This is because a washing machine can agitate them and cause the foam to tear. All is not lost though. There is still a way to keep these more comfortable and cushioned mattress covers clean. First, remove any dust and dander by vacuuming the foam pad. It is easier to use a vacuum attachment or a handheld smaller vacuum, so you can better control and direct it. ​Related: Should You Dust or Vacuum First? Next, if there are any stains, spot clean them. Use a mild detergent or an enzyme based cleaner to penetrate any stains and clear them. Another great option is to make your own cleaner with vinegar. Spot cleaning is an essential step prior to cleaning to make sure you don't go to hard on the entire cover for a small problematic spot. This goes the same for cleaning all other materials, including carpet. Let the solution sit for about ten to twenty minutes and rinse it by blotting up the cleaner with a sponge filled with clean water. You don’t want to squeeze and soak the foam. Instead, lightly apply a blotting with the sponge so a little water is worked into the stained area. Finally, get up as much water as you can by blotting the area with a clean and lightly colored towel. Using a dark towel can sometimes cause dye bleeding into your foam mattress cover. Make sure the spot is fully dry before you place it back on your bed and cover it up with a sheet. If left wet or damp, it can grow mold or bacteria. ​​​If you are trying to find out if you can wash a memory foam mattress topper, you will be pleased to know you can. Since it is memory foam, it may not be able to be traditionally washed in a machine as easily as a cotton-based mattress topper. Make sure you read the care label to see if there are any special instructions or guidelines before you begin the next step. The best way to wash a memory foam mattress topper is to do it by hand. You can use a mild detergent or use baking soda. ​​​This cleaning method takes the least amount of time since you do not need to get the mattress topper wet. The baking soda will penetrate into the fibers and cling to any dirt or dander and help pull it up when you vacuum up the baking soda. Baking soda will also neutralize any lingering odors. Just make sure you leave the baking soda sitting on the mattress topper for at least fifteen minutes to make sure it is able to work. ​For a powerful one-two punch, spray vinegar onto the mattress cover before applying the baking soda. Baking soda can also clean a whole multitude of things, that includes cleaning showers, drains, and also materials like wool. ​​​Similar to the spot cleaning, if you need to wash your entire mattress topper, you will want to follow the instructions for spot cleaning. The easiest way to accomplish this task is to put your cleaning solution into a spray bottle and lightly spray the mattress. You do not want to soak the mattress topper, because then it will take longer to rinse and dry. Also, to make it a less daunting task, split your mattress into sections such as quarters and work on cleaning each section before moving onto the next. Since you now have the entire foam mattress wet or damp, you will need to allow it to dry for a few days. Using forced air such as a blow dryer can ruin its shape and damage the foam. It is best to put it in a well-ventilated area to dry. Flip it onto the other side multiple times a day if it is soaked all the way through. Now that you know the ins and outs of washing a mattress cover, you can keep your bed clean and your mattress protected for many years of good night sleeps.